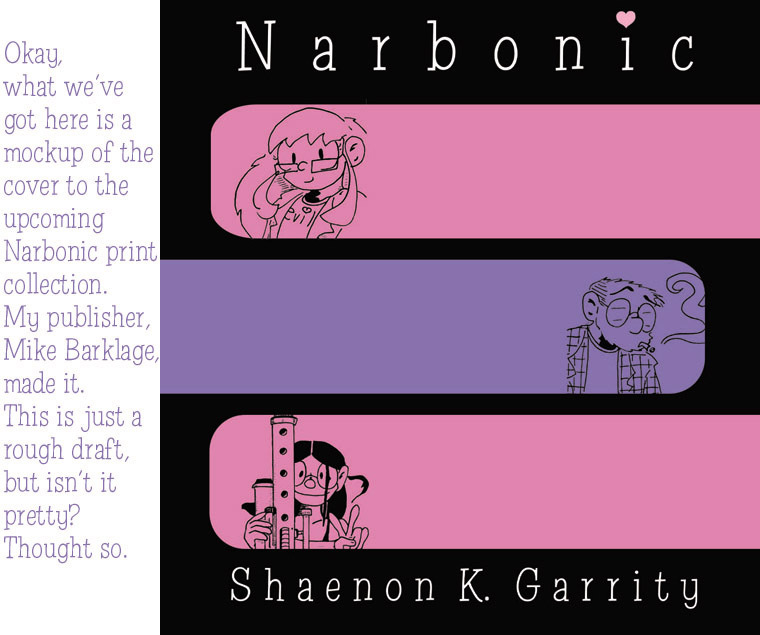 Obviously I was super excited beyond all reason when Mike Barklage and I put together the first Narbonic print book. It was almost like being a real cartoonist! I’m no good at book design stuff, and the adorable pink-and-purple-and-black covers Mike came up with over the years are way better than anything I could have come up with on my own. If it were up to me, it’d just be the title in twelve-point Times New Roman. Speaking of which, here’s the cover for the sixth and final Narbonic collection, which we’re assembling right now and it will totally be out soon, I swear. The design is based on a stained-glass gerbilfly made my the amazing Tiff Hudson. Thanks very much to Mike and to Tiff for a lovely final cover. This volume will include a bonus story written by me and drawn by Andrew Farago, plus an introduction by superstar comic-book scripter Gail Simone. Well. That could all be in book six, I s’pose. On the island where destruction is planned! Will persuade you to go out and buy! Help your fa-vor-ite comic artiste! Awwwwww!! That’s great, Shaenon. I’m glad you liked it. Are the other images on the cover a cipher? It looks like a substitution cipher made from dingbats, but it’s kinda hard to tell. You can see a little more about the stained-glass gerbilfly at http://home.comcast.net/~tfhudson. I want a complete works! Pretty please with pink gerbils? Tiff: Dunno, but it’s the same font that Dave speaks in briefly after he [SPOILER REDACTED]. According to Mike, the dingbat text spells out a certain passage from Alice in Wonderland. Tiff: Yes, it quotes the same part of [SPOILER REDACTED], except without any punctuation. (You mean, you can’t just read it?) Now I want to know if what Dave says actually makes any sense, given enough text to decode with.